If you have a little boy at home, chances are you have heard of The Trash Pack. You know, the Gross Gang in your Garbage. Dexter has been clamoring about them since he saw them on TV and now, he's got to have them. He says "look how gross and cool that is Mom!" and "Mom, look at that garbage, maybe it will make Ollie puke!" Oh Lord help me, I have two weird boys!! I chose The Trash Pack for my Gift Guide I love that their prices start at just $2.99 for a 2 pack of Trashies and go on up to about $19.99 each for the Street Sweeper and Garbage Truck. What little boy doesn't like getting dirty and talking about garbage? My boys are in love with fart and poop jokes so this is right up their alley! 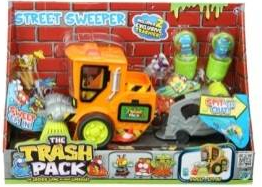 How would you like to win your very own Street Sweeper and 3 Pack of Trashies? *Tweet about this giveaway: "FLASH GIVEAWAY #win a $25 Trash Pack prize from @royaldixie http://bit.ly/UzCB3K ends 12/20"
My twins sons would get this. They have been asking for Trash Pack stuff for Christmas. My daughter would have a great time wthi them, she is such a tomboy!